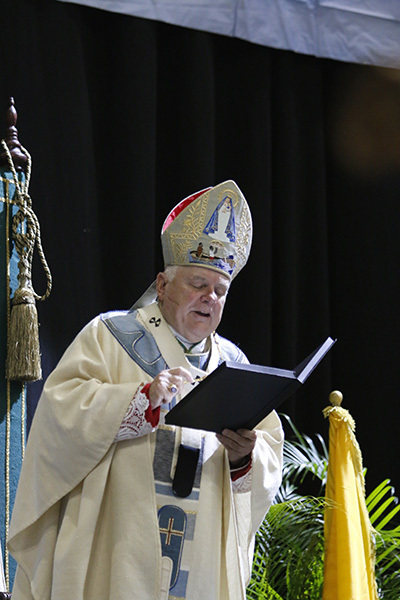 Archbishop Thomas Wenski presides at the annual Mass on the feast of Our Lady of Charity, patroness of Cuba. This year's celebration marked the 20th anniversary of her coronation by St. John Paul II during his 1998 visit to the island. 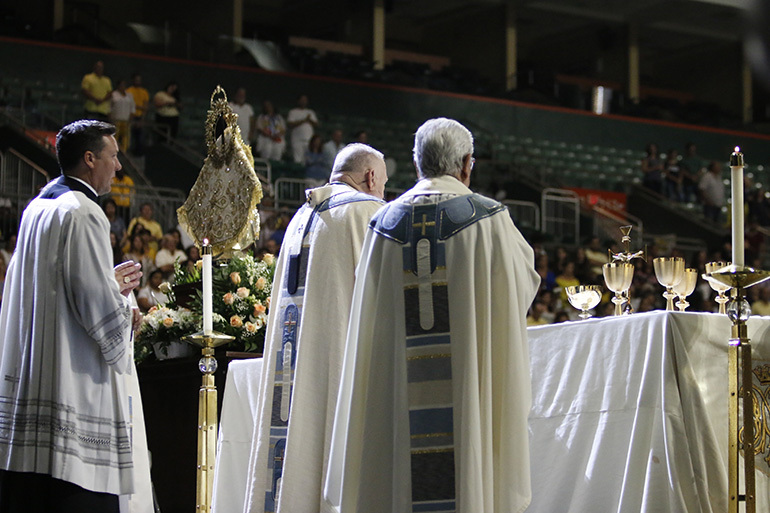 Archbishop Thomas Wenski read this statement at the conclusión of the anual Mass for the feast of Our Lady of Charity, celebrated Sept. 8, 2018 at the Watsco Center on the University of Miami campus. Archbishop Thomas Wenski delivers remarks at the conclusion of the 2018 Mass for the feast of Our Lady of Charity. He alluded to the scandal of sexual abuse still plaguing the Church, and the "acts of commission or omission" of Church leaders. Today the celebration of this feast of the Virgin of Charity fills us with joy. However, in these days, we are very concerned about the crisis that plagues our Church. As one day, Judas betrayed Jesus, there are those who in our days have betrayed him by acts of commission or omission. But, instead of despairing, we turn to our Mother. She, for being the first disciple, is for each one of us a model and she is the image of the Church, the immaculate spouse of the Lord. Mary shows us the way to overcome this crisis. The Gospels give us four words that are like a summary of her life and can serve as a road map for us to follow. The first word: Fiat. “Be it done to me according to your word”. May we seek like Mary to fulfill the will of God in all things and above all things. Second word: Magnificat. “My soul proclaims the greatness of the Lord.” Let each of our thoughts, words and actions serve to glorify God and edify our brothers and sisters. Third word: Conservabat. “She kept everything that had happened in her heart.” May we keep the word of God in our hearts. May the light of his Word disperse the darkness of sin and illuminate our actions. Fourth word: Stábat. “She stayed next to the Cross.” Following Mary's example, may we always be close to the suffering, the forgotten, the hurt. The pope emeritus, Benedict XVI, once said, "When the world reminds us of our sins, the proper response is not denial but repentance." Therefore, before the final blessing, I invite you to pray with me one last "Ave". 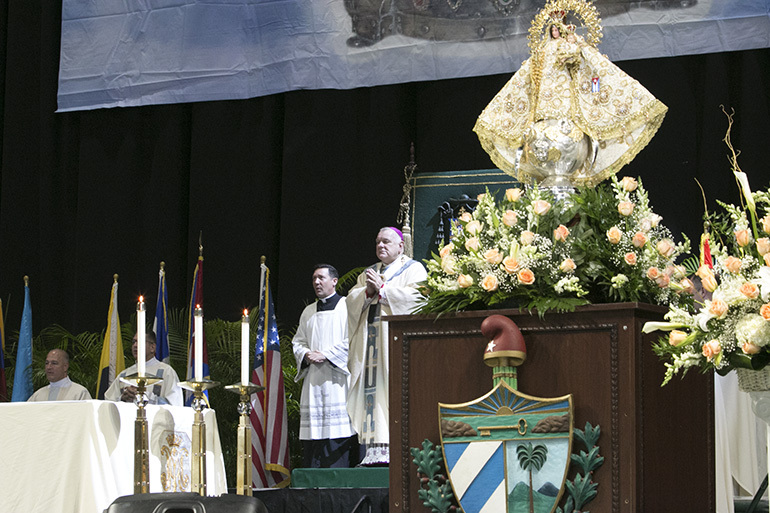 Archbishop Thomas Wenski presides at the 2018 Mass for the feast of Our Lady of Charity, patroness of Cuba. This year's celebration marked the 20th anniversary of her coronation by St. John Paul II during his 1998 visit to the island.